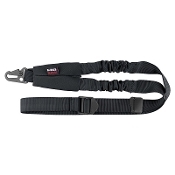 Single-point sling with bungee section for comfort and movement. Steel snap clip and bungee section are shrouded by webbing. Quick-release buckle allows sling to be removed without taking it over the head, useful when worn under a jacket. Attaches directly to AR-15 single point sling end-plate.